While public transportation in Israel is excellent, Safed's location as a remote mountain town in middle of Israel's northern upper Galilee Mountains makes this city a bit of challenge to get to sometimes. Read on to find out the best ways to reach Safed whether coming by bus or by train, or by a combination of both. Unfortunately, Israel's excellent and easy to travel rail system hasn't yet reached the city of Safed, or any region in the interior area of the north of the country. However, this doesn't mean you can't still utilize Israel's rail lines to reach this mountain city. If you are in Jerusalem then take a bus from Jerusalem's central bus station to Tel Aviv. You can choose to disembark in Tel Aviv at either the New Central Bus Station or the Arlozorov Station. You will then switch from the bus to the train at these stations. In both locations you will have about a two minute walk from the bus station to the train station. However, the New Central Bus Station in Tel Aviv is more than a bit seedy and run down. If possible, take a bus to the Arlozorov Station in Tel Aviv which is an open air, outdoor station. It is a more pleasant experience. Next, you will want to board a train from Tel Aviv to the city of Akko (known in English as Acre). From Akko you will then switch to a bus to Safed. This option allows for the greatest flexibility because buses leave Jerusalem for Tel Aviv several times an hour from very early morning until late night and trains leave Tel Aviv for Akko at least twice an hour. They even run once an hour through the night. Buses from Akko to Safed also run about twice an hour starting at 6:00am and ending around 22:15. The bus from Jerusalem to Tel Aviv takes approximately one hour, depending on traffic, the train from Tel Aviv to Akko takes one and half hours, and the bus from Akko to Safed takes one hour and twenty five minutes. Total travel time on this route from Jerusalem to Safed takes four hours, not including waiting, switching and standing time. 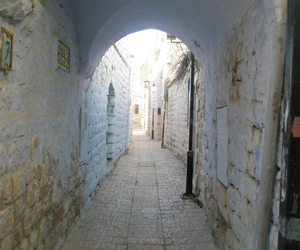 For a more direct route from Jerusalem to Safed you can take a bus direct. There are direct buses from the Jerusalem Central Bus Station to the Safed Central Bus Station. Bus number 982 departs from Jerusalem seven times a day beginning at 9:18am. The last bus is at 23:18. On Friday buses cease running early and buses will run every hour from 9:18am until 13:18. The cost for this bus is 40nis and the total travel time is three and half hours. There is also one direct bus daily from Tel Aviv to Safed. It departs from the New Central Bus Station in Tel Aviv at 17:00 and then pickups at the Arlozorov Bus Station at 17:05. The trip costs 45nis and takes approximately three and half hours, if you are not held up by traffic. This should put you in the Safed Central Bus Station at 8:30pm. On Friday the bus departs Tel Aviv 12:30pm, 12:35 at Arlozorov, and arrives in Safed at 16:00. The bus from Tel Aviv to Safed is bus number 845. Total travel time on the bus is three and half hours. To find out a detailed and up-to-date bus schedule that includes all bus times and destinations, check www.egg.co.il and click on the Eng (for English language option) on the upper left hand corner of your screen. For a detailed train schedule go to www.rail.co.il/EN/Pages/HomePage.aspx.